The structure of this steroid is that of a moderate anabolic/ potent androgen which does not aromatize to estrogen. Water retention and gynecomastia therefore do not come into play with this drug. Mastasim 100 is very useful in a cutting phase. The user can achieve that "ripped" look so popular to professional bodybuilding. A cycle of this drug combined with Winstrol, Primobolan or Oxandrolone should provide great muscle retention and fat loss, during a period which can be very catabolic without steroids. It can also be successfully combined with other steroids, even Sustanon and Deca-durabolin for an enhanced effect. 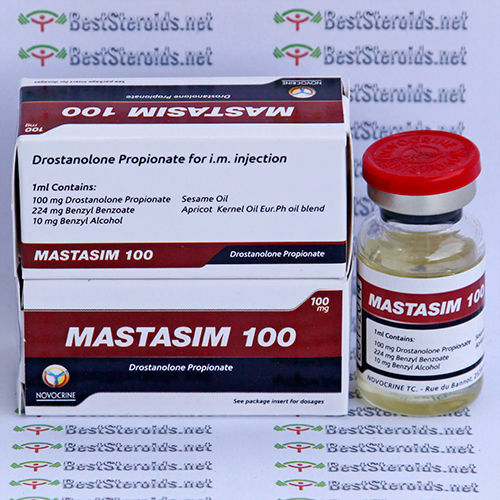 Since the propionate ester is used with this compound, injections need to be repeated at least every 3 or 4 days in order to maintain a consistent level of hormone in the blood (best is to be injected 100-150mgs EOD - every other day). The weekly dosage is in the range of 300-500mg. Since estrogen is not an issue, side effects are generally mild with this steroid. AWESOME! It incinerated my last layer if bodyfat. It's gets you ripped! Leaned me out amazingly while giving me boners as the wind blows. A must add to all cycles. Delivery time 11 days. 3 weeks with this product 0 pip, 100 EOD, hard muscle, less water, amazing muscle rock, i love it!! Muscles in shoulders and arms hardened up almost immediately.